- This unique boundary lies at the base of the Ediacaran in the late Neoproterozoic part of the geological record. - The identification of this boundary with the onset of the Flood implies that a staggering amount of tectonic catastrophism also must have accompanied the large amount of erosion and sedimentation involved. - This striking erosional unconformity, which simultaneously corresponds to time/age, tectonic, sedimentary, and paleontological discontinuities, is indeed of global extent (Ager 1973, 10-11). - The violence of the erosion at this discontinuity is revealed by huge quartzite boulders in the basal portion of the Tapeats Sandstone in the Grand Canyon. - Figure 9 is a photograph of one of these boulders that is 4.5 m in diameter and weighs 200 tons. 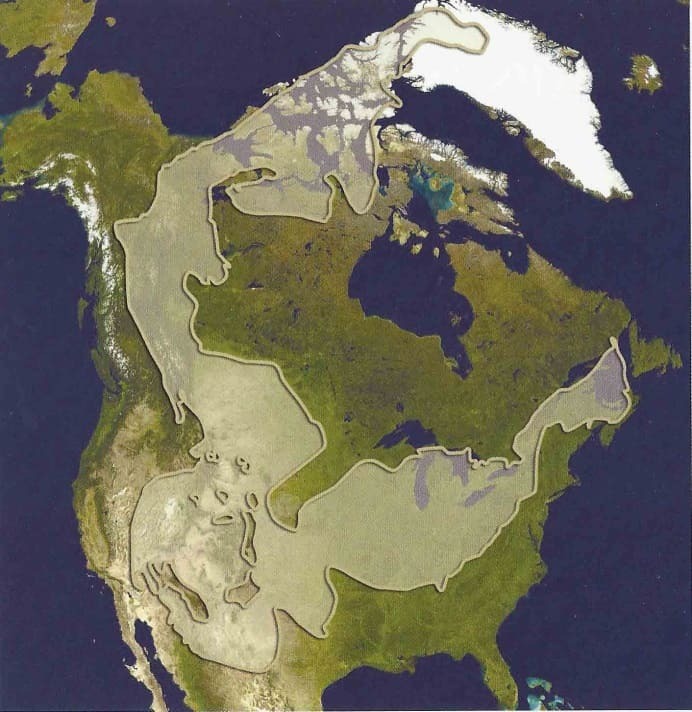 - Figure 10 is a map showing the lateral extent of the Cambrian Tapeats Sandstone and its equivalents across North America. - The Tapeats Sandstone corresponds to the base of what is known as the Sauk Megasequence, the lowest of six sediment megasequences, originally identified and described by Sloss (1963) in North America, that are separated from one another by global-scale erosional unconformities (Snelling 2009, 528-530, 740-741). - Figure 11 is a simplified representation of how these six large packages of sediment are distributed in an east-west direction across the North American continent. - What is striking is that separating each megasequence from the next is a craton-wide erosional unconformity. <HOW?>- The six erosional unconformities essentially beveled the continental surface flat before the deposition of the next thick sequence of sedimentary layers. - Figure 11. Diagram showing the six Phanerozoic megasequences described originally by Sloss (1963) for the North American craton. <SHOW CRATONS>- These six huge packages of sediment are thickest near the craton margins and thinnest near the craton center. - The numerical approach applies the equations of open channel turbulent flow to model sediment transport and deposition within the framework of a scheme that solves the shallow water equations on a rotating sphere. circular supercontinent that covers 38% of the spherical surface. - Numerical experiments so far suggest that large tidal pulses are required to drive the water strongly enough to erode, transport, and deposit the required volumes of sediment. - Figure 13 contains snapshots of the solution from this model at a time of only one day after the onset of a tidal pulse of amplitude 2500 m centered at 30° latitude and 90° longitude relative to the center of the continent. - The circular continent initially is slightly domed, with a height of 150 m above sea level at its center and 24 m below sea level about its perimeter. - The surrounding ocean has a uniform depth of 4000 m.
- Figure 13. Snapshots at time of one day after the onset of a 2500 m high tidal pulse of (a.) suspended sediment load, (b.) cumulative bedrock erosion, (c.) net cumulative sedimentation, and (d.) topographic height relative to sea level in a global erosion/sedimentation model. - The velocities indicated are the velocities near the top of the moving water layer. - The vertical water velocity profile decreases to zero in a logarithmic manner at the land surface according to standard turbulence theory. - Cavitation erosion of crystalline bedrock is assumed to produce sediment that is 70% fine sand with a mean grain size of 0.063 mm, 20% medium sand with a mean grain size of 0.50 mm, and 10% coarse sand with a mean grain size of 1.0 mm. - Bottom friction and turbulent eddy viscosity are included in the momentum equation and cause the water velocities to diminish with time. - Nevertheless, moderate erosion and sedimentation continues for several weeks after the tidal pulse. - A significant amount of erosion occurs at the continent margin. - The experiments conducted thus far indicate that six such pulses spaced about 30 days apart are adequate to erode, transport, and deposit, on average, the 1,800 m of sediment observed to blanket the continental surface today. - The strong, global-scale tsunami-like waves these pulses initially generate do indeed result in erosional unconformities that affect most of the continent surface. <SEE>- For more details of the model and a more complete description of this specific case, see Baumgardner (2013). - Figure 14 provides a summary glimpse into some of the general characteristics of this record. - One feature is the thickness of the sequence, originally some 5000 m in this Colorado Plateau region before later erosion removed a significant fraction. - Why is there so little erosional channeling at formation boundaries within the thick layer-cake like succession of layers, as illustrated in Figure 15 (Snelling 2009, 591-592)? - Nowhere on earth is there currently such a sequence of layers, mostly of marine affinity, with such vast lateral extent being deposited within continent interiors. - Figure 14. Illustrative north-south cross section of the western Colorado Plateau region of North America. Note the generally smooth contacts at formation boundaries, in contrast with the channelized topography of the continental surface today. Most of the formations shown here are laterally continuous over hundreds of thousands of square km. Some with their equivalents are global in lateral extent. - Moreover, many formations throughout the Phanerozoic sedimentary record display persuasive internal evidence for rapid, even catastrophic, deposition. - This is true for many of the formations in the Colorado Plateau shown in Figure 14, especially several of the strongly cross-bedded sandstone formations, beginning with the Cambrian Tapeats Sandstone (Snelling 2009, 506, 508, 528-530), but also including the Permian Coconino Sandstone (Snelling 2009, 501-510, the Triassic Shinarump Conglomerate (Snelling 2009, 519-520), and the Jurassic Navajo Sandstone (Morris, 2012, 163). - Although the Coconino crossbeds are interpreted in the conventional literature as eolian, there are several compelling reasons to reject that interpretation and instead conclude that they must be the product of water action. <1>- The first reason is the grain size distribution. - The Coconino sand is poorly sorted with a bimodal distribution consisting of two populations of grain sizes, each of which is log-normal distributed. - By contrast, wind-borne sand in a desert environment is almost always well-sorted with a unimodal grain size distribution. <2>- The second reason concerns the crossbed angle relative to the horizontal. - In desert dunes, the bedding angle is close to the angle of repose of dry sand, which is 31°. By contrast the crossbed angle observed in modern marine environments is 20-25°, which is what is observed for the Coconino. <3>- A third reason involves mineralogical composition. - Because biotite grains are so fragile, there are quickly destroyed under desert wind conditions. <4>- A fourth reason is the presence of recumbent folding observed within the Coconino crossbeds. - This phenomenon is common today in alluvial settings where gravity-induced shear occurs at the base of sand waves as grains are able to rotate in water-supported sand, and the sand wave partially collapses. - Such a process does not occur, however, in dry sand. <5>- A fifth reason is the abundance of well-preserved animal trackways on many crossbed surfaces in the Coconino. - Wet sand is essential for such preservation. - It is difficult to conceive how trackways could possibly be a common feature in desert dunes. <6>- Finally, the Coconino has inter-tonguing layers of water-deposited dolomite near its boundary with the overlying Toroweap Formation, which itself is clearly marine. - A key line of evidence supporting a catastrophic, world-destroying Flood is the huge lateral extent of so many of the sedimentary formations and the staggering volumes of sediment they represent. - The uniformity of a formation as laterally extensive as the Coconino suggests a coherent rapidly moving water column capable, by virtue of its turbulence, of suspending a considerable thickness of sediment and transporting it a considerable distance before deposition finally takes place. - Under such conditions it is not surprising that sand waves could result in the deposition zone. - Figure 18 shows how crossbeds can form in response to sustained water flow with a sustained supply of sand falling from suspension. - Indeed, to deposit the average amount of Phanerozoic sediment observed to be present [on] the continents today, 1800 m, ... unmistakably requires — on average — tens of m of sediment in suspension in a tsunami-like column of water which is thick enough to support such a sediment load, moving with a speed of at least tens of m/s (Baumgardner 2013). - The presence of many layers in the sediment record that require such conditions for their formation testify to the reasonableness of such conclusions. - Massive sheet erosion seems to be required to remove huge volume of sediment once present but now missing from much of the Colorado Plateau region (Snelling 2009, 595-596). - Figure 23 shows the global distribution of sediment today. - It is clear from this map that the thickest accumulations of sediment are along the continent margins, mostly on the continental shelves. - Figure 22. Diagram illustrating the huge volumes of sediment stripped away from continent interiors in the latter stages of the Flood cataclysm. <>- This unique boundary lies at the base of the Ediacaran in the late Neoproterozoic part of the geological record. - Where Ediacaran sediments are missing, it coincides with the Precambrian-Cambrian boundary where Cambrian sediments are present. <>- The identification of this boundary with the onset of the Flood implies that a staggering amount of tectonic catastrophism also must have accompanied the large amount of erosion and sedimentation involved. - This paper summarizes some of the work done over the past thirty years to apply numerical modeling to investigate various aspects of this year-long event that dramatically refashioned the face of the earth. - Although the paleontological discontinuity is commonly referred to as the ‘Cambrian explosion’ because of the sudden appearance of almost every modern animal phylum in the lower Cambrian strata, it is now clear that the organisms fossilized in the Ediacaran sediments also are part of this explosion, because the Ediacaran sediments lie above the global scale erosional discontinuity. <>- This striking erosional unconformity, which simultaneously corresponds to time/age, tectonic, sedimentary, and paleontological discontinuities, is indeed of global extent (Ager 1973, 10-11). - In much of North America, the sedimentary layer just above this discontinuity is the Tapeats Sandstone and its equivalents. <>- The violence of the erosion at this discontinuity is revealed by huge quartzite boulders in the basal portion of the Tapeats Sandstone in the Grand Canyon. <>- Figure 9 is a photograph of one of these boulders that is 4.5 m in diameter and weighs 200 tons. <>- Figure 10 is a map showing the lateral extent of the Cambrian Tapeats Sandstone and its equivalents across North America. - This prominent erosional discontinuity, here beneath the Tapeats Sandstone but worldwide in its distribution, has become known as the Great Unconformity. <>- The Tapeats Sandstone corresponds to the base of what is known as the Sauk Megasequence, the lowest of six sediment megasequences, originally identified and described by Sloss (1963) in North America, that are separated from one another by global-scale erosional unconformities (Snelling 2009, 528-530, 740-741). <>- Figure 11 is a simplified representation of how these six large packages of sediment are distributed in an east-west direction across the North American continent. <>- What is striking is that separating each megasequence from the next is a craton-wide erosional unconformity. <><HOW?>- The six erosional unconformities essentially beveled the continental surface flat before the deposition of the next thick sequence of sedimentary layers. - As just mentioned, the Tapeats Sandstone and its equivalents lie just above the first of these six erosional unconformities. - It is also useful to note here that where Neoproterozoic Ediacaran sediments are present, this first erosional unconformity occurs just beneath these sediments. - The basal formation of the next megasequence, known as the Tippecanoe Megasequence, is the widely distributed St. Peter Sandstone. - Figure 12 displays the lateral distribution for this distinctive sandstone formation. <><SHOW CRATONS>- These six huge packages of sediment are thickest near the craton margins and thinnest near the craton center. - They are separated from one another by craton-wide erosional unconformities. - The Tapeats sandstone and its equivalents are the basal unit of the Sauk megasequence in North America. - In the context of the global Flood described in the Torah, what could possibly have been the mechanism that resulted in such a large-scale pattern of erosion and sedimentation? - Recently Baumgardner (2013) has developed a numerical model designed to explore this issue. <>- The numerical approach applies the equations of open channel turbulent flow to model sediment transport and deposition within the framework of a scheme that solves the shallow water equations on a rotating sphere. - The treatment of erosion is restricted to cavitation. - Up to this point the continental geometry has been restricted to a single circular supercontinent that covers 38% of the spherical surface. <>- Numerical experiments so far suggest that large tidal pulses are required to drive the water strongly enough to erode, transport, and deposit the required volumes of sediment. <>- Figure 13 contains snapshots of the solution from this model at a time of only one day after the onset of a tidal pulse of amplitude 2500 m centered at 30° latitude and 90° longitude relative to the center of the continent. <>- The circular continent initially is slightly domed, with a height of 150 m above sea level at its center and 24 m below sea level about its perimeter. <>- The surrounding ocean has a uniform depth of 4000 m.
<>- Figure 13. Snapshots at time of one day after the onset of a 2500 m high tidal pulse of (a.) suspended sediment load, (b.) cumulative bedrock erosion, (c.) net cumulative sedimentation, and (d.) topographic height relative to sea level in a global erosion/sedimentation model. <>- The velocities indicated are the velocities near the top of the moving water layer. <>- The vertical water velocity profile decreases to zero in a logarithmic manner at the land surface according to standard turbulence theory. <>- Cavitation erosion of crystalline bedrock is assumed to produce sediment that is 70% fine sand with a mean grain size of 0.063 mm, 20% medium sand with a mean grain size of 0.50 mm, and 10% coarse sand with a mean grain size of 1.0 mm. - A modest amount of isostatic compensation is folded into the topography calculation. <>- Bottom friction and turbulent eddy viscosity are included in the momentum equation and cause the water velocities to diminish with time. <>- Nevertheless, moderate erosion and sedimentation continues for several weeks after the tidal pulse. <>- A significant amount of erosion occurs at the continent margin. <>- The experiments conducted thus far indicate that six such pulses spaced about 30 days apart are adequate to erode, transport, and deposit, on average, the 1,800 m of sediment observed to blanket the continental surface today. <>- The strong, global-scale tsunami-like waves these pulses initially generate do indeed result in erosional unconformities that affect most of the continent surface. <><SEE>- For more details of the model and a more complete description of this specific case, see Baumgardner (2013). - Already discussed is clear physical evidence associated with the Tapeats Sandstone and its equivalents of global-scale catastrophic process at the Flood’s onset. - Equally clear indicators of high-energy laterally-extensive processes are also abundant throughout the subsequent geological record. - There is space here to highlight only a few examples. <>- Figure 14 provides a summary glimpse into some of the general characteristics of this record. <>- One feature is the thickness of the sequence, originally some 5000 m in this Colorado Plateau region before later erosion removed a significant fraction. - What physical process would lower the surface of the normally high-standing continents so that they could receive so much sedimentary deposition? <>- Why is there so little erosional channeling at formation boundaries within the thick layer-cake like succession of layers, as illustrated in Figure 15 (Snelling 2009, 591-592)? - These features of the record are sufficient by themselves to falsify the claim that “the present is the key to the past” as far as the sediment record is concerned. <>- Nowhere on earth is there currently such a sequence of layers, mostly of marine affinity, with such vast lateral extent being deposited within continent interiors. <>- Figure 14. Illustrative north-south cross section of the western Colorado Plateau region of North America. Note the generally smooth contacts at formation boundaries, in contrast with the channelized topography of the continental surface today. Most of the formations shown here are laterally continuous over hundreds of thousands of square km. Some with their equivalents are global in lateral extent. <>- Moreover, many formations throughout the Phanerozoic sedimentary record display persuasive internal evidence for rapid, even catastrophic, deposition. <>- This is true for many of the formations in the Colorado Plateau shown in Figure 14, especially several of the strongly cross-bedded sandstone formations, beginning with the Cambrian Tapeats Sandstone (Snelling 2009, 506, 508, 528-530), but also including the Permian Coconino Sandstone (Snelling 2009, 501-510, the Triassic Shinarump Conglomerate (Snelling 2009, 519-520), and the Jurassic Navajo Sandstone (Morris, 2012, 163). - The Permian Coconino Sandstone is easy to recognize in the Grand Canyon. - Figure 16 is a photograph taken by the author from the Hance Trail that begins on the south canyon rim. Well-developed cross-bedding is evident in this photo. - Figure 16. Exposure of the Permian Coconino Sandstone near the south rim of the Grand Canyon (foreground). Note the evident cross-bedding. The formation is also easy to identify on the opposite side of the canyon. <>- Although the Coconino crossbeds are interpreted in the conventional literature as eolian, there are several compelling reasons to reject that interpretation and instead conclude that they must be the product of water action. <><1>- The first reason is the grain size distribution. <>- The Coconino sand is poorly sorted with a bimodal distribution consisting of two populations of grain sizes, each of which is log-normal distributed. <>- By contrast, wind-borne sand in a desert environment is almost always well-sorted with a unimodal grain size distribution. <><2>- The second reason concerns the crossbed angle relative to the horizontal. <>- In desert dunes, the bedding angle is close to the angle of repose of dry sand, which is 31°. By contrast the crossbed angle observed in modern marine environments is 20-25°, which is what is observed for the Coconino. <><3>- A third reason involves mineralogical composition. - The Coconino sand includes biotite, a type of mica, at approximately the 1% level. <>- Because biotite grains are so fragile, there are quickly destroyed under desert wind conditions. <><4>- A fourth reason is the presence of recumbent folding observed within the Coconino crossbeds. <>- This phenomenon is common today in alluvial settings where gravity-induced shear occurs at the base of sand waves as grains are able to rotate in water-supported sand, and the sand wave partially collapses. <>- Such a process does not occur, however, in dry sand. <><5>- A fifth reason is the abundance of well-preserved animal trackways on many crossbed surfaces in the Coconino. <>- Wet sand is essential for such preservation. <>- It is difficult to conceive how trackways could possibly be a common feature in desert dunes. <><6>- Finally, the Coconino has inter-tonguing layers of water-deposited dolomite near its boundary with the overlying Toroweap Formation, which itself is clearly marine. <>- A key line of evidence supporting a catastrophic, world-destroying Flood is the huge lateral extent of so many of the sedimentary formations and the staggering volumes of sediment they represent. - This is certainly true of the Coconino Sandstone. - Figure 17 is an isopach map of a portion of the Coconino Sandstone and its equivalents, corresponding to an area of than 500,000 km2 and a volume of more than 40,000 km3. <>- The uniformity of a formation as laterally extensive as the Coconino suggests a coherent rapidly moving water column capable, by virtue of its turbulence, of suspending a considerable thickness of sediment and transporting it a considerable distance before deposition finally takes place. <>- Under such conditions it is not surprising that sand waves could result in the deposition zone. <>- Figure 18 shows how crossbeds can form in response to sustained water flow with a sustained supply of sand falling from suspension. <>- Indeed, to deposit the average amount of Phanerozoic sediment observed to be present [on] the continents today, 1800 m, ... unmistakably requires — on average — tens of m of sediment in suspension in a tsunami-like column of water which is thick enough to support such a sediment load, moving with a speed of at least tens of m/s (Baumgardner 2013). <>- The presence of many layers in the sediment record that require such conditions for their formation testify to the reasonableness of such conclusions. - Not only were catastrophic processes involved in the creation of the thick accumulation of sediment layers on the continents, but observations reveal that a significant fraction of this deposited sediment was subsequently stripped away in a rapid manner near the end of the cataclysm. 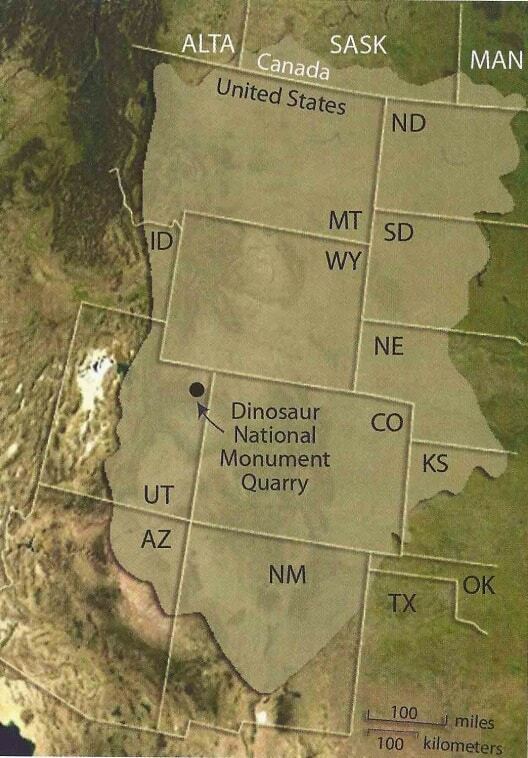 - This [is] shown in a relatively clear way in the Colorado Plateau region of North America as indicted in Figure 22. <>- Massive sheet erosion seems to be required to remove huge volume of sediment once present but now missing from much of the Colorado Plateau region (Snelling 2009, 595-596). - This suggests that a rapid increase in the volume of the oceans and a consequent rapid lowering of the global sea level may be responsible [for] a rapid runoff of water from the continent interiors that removed a notable fraction of the upper layers of sediment that had not yet been cemented and lithified. <>- Figure 23 shows the global distribution of sediment today. <>- It is clear from this map that the thickest accumulations of sediment are along the continent margins, mostly on the continental shelves. <>- Figure 22. Diagram illustrating the huge volumes of sediment stripped away from continent interiors in the latter stages of the Flood cataclysm. - A major enigma in continental geology today is why a major portion of the uplift of the earth’s major mountain belts occurred so recently, during the Pliocene and Pleistocene (Ollier and Pain 2000), while, presumably, most of the crustal thickening required to support such elevated topographical features had taken place millions or even tens of millions of years earlier. - The Flood, involving catastrophic tectonic processes to be described later in this paper as well as a dramatically compressed timescale, readily solves this enigma (Baumgardner 2005b). - The Flood also nicely accounts for an Ice Age afterward. - The warming of the oceans during the Flood caused higher evaporation rates over the oceans and significantly increased precipitation rates, especially at high latitudes, following the Flood. - This resulted in more snowfall at high latitudes and at high mountain elevations during the winters than could melt in the summers, resulting in rapidly growing ice sheets and mountain glaciers (Austin et al. 1994; Snelling 2009, 769-786). - Thus far, the focus has been on the evidence for the rapid, catastrophic formation of the fossil-bearing sediment record on the continents during the Flood. - What occurred in the ocean basins? - A major development following World War II, as the sonar technology developed to find and track submarines was applied to mapping the topography of the seafloor, was the discovery of the mid-ocean ridge system that winds around the sea bottom like the seam of a baseball. - Figure 24 shows the segment known as the Mid-Atlantic Ridge of this global feature that bisects the North and South Atlantic Ocean basins. - The subsequent quest to understand this remarkable global feature led to the development and acceptance of the concepts of plate tectonics in the 1960’s (Snelling 2009, 365-415). - Figure 24. Topographical map of the Atlantic Ocean Floor. (From National Geographic Society, 1968) All the basaltic ocean crust on the earth today is of Mesozoic age or younger. - As rocks and sediment cores from the ocean floor were recovered and analyzed, it was discovered that today’s ocean floor is all younger than early Mesozoic. - All ocean floor from earlier in the earth’s past has been subducted into the earth’s interior, except for tiny fragments that have been thrust onto the continents and preserved as ophiolites. - Figure 25 shows the point in the continental record below which no ocean floor exists at the earth’s surface. <__?__PACIFIC SEAFLOOR TOO?>- In other words, all the igneous ocean crust on earth today cooled from a molten state at a mid-ocean ridge as shown in Figure 26 since that point in the continental record. - Figure 25. Diagram marking the point in the continental stratigraphic record where the history of the current ocean floor begins. - Figure 26. Diagram illustrating the structure of the mid-ocean ridge system, formed as adjacent plates of oceanic lithosphere diverge. Partial melting of upper mantle rock occurs beneath the ridge axis to generate molten basalt that rises, cools, and crystallizes to form new ocean crust between the spreading plates. - What does this imply about mechanics of the Flood cataclysm? - It implies that a vast amount of subduction and seafloor spreading must have unfolded during the Flood and that subduction and seafloor spreading must have been a major aspect of the overall Flood cataclysm (Baumgardner 1986; Austin et al. 1994; Snelling 2009, 691). - Because none of the pre-Flood or Paleozoic ocean floor is to be found at the earth’s surface today, all of this ocean lithosphere must have been cycled into the earth’s interior during the year of the Flood. - The logic is just that tight.